The two centuries between a.d. 250 and a.d. 450 witnessed the creation of a distinctive Christian Greek culture in the eastern part of the Roman empire. This book focuses on the transition from ancient to Christian Hellenism as it was expressed in the biographical and panegyric literature of the period. The essays show how literary genres focusing on individual lives help to reveal this historical process. The contributors are leading scholars who bring several disciplines to bear on these texts: they are historians, theologians, classicists, and historians of religion. Together, the collection presents much new research and helps show Late Antiquity not only as an important transitional period but also as an era with an identity of its own. Among the figures the biographical texts bring to life are Antony the Great, the charismatic desert father, and Basil of Caesarea, the influential church politician. Collectively the essays go beyond discussion of particular texts to consider such general topics as strategies of rhetoric and representation, the place of classical Greek culture in both pagan and Christian education, and what is meant by philosophy as a way of life. 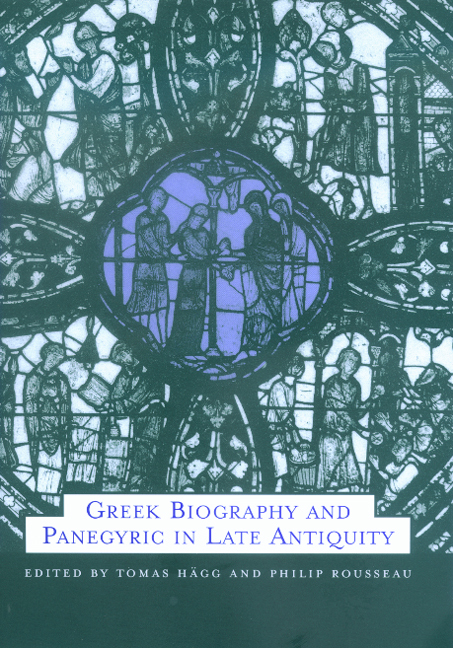 Greek Biography and Panegyric in Late Antiquity will send readers back to many Late Antique texts with an enhanced appreciation of how these highly idiosyncratic works exhibit in concentrated form some of the most characteristic and widespread values, tensions, and literary strategies of their age. Tomas Hägg is Professor of Classical Philology at the University of Bergen and author of The Novel in Antiquity (California, 1983), among other books. Philip Rousseau, Associate Professor of History at the University of Auckland, is currently Andrew W. Mellon Professor of Early Christian Studies at the Catholic University of America and author, most recently, of Basil of Caesarea (California, 1994).